Has there been optimal time of year to raise a seed round? 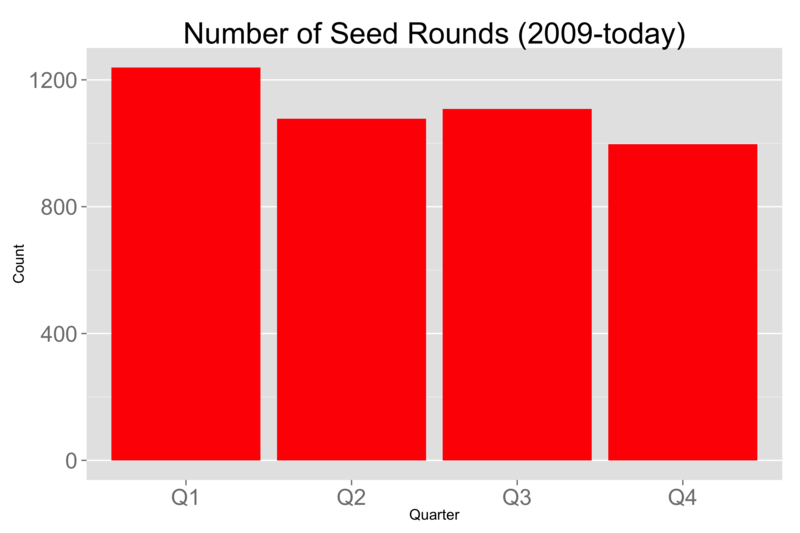 The chart above shows the number of seed rounds by quarter of the year from 2009-2013. At first blush, it would seem that the first quarter of the year is the most attractive period to raise a seed round. But that’s a faulty conclusion. First, there’s no statistical difference between the number of rounds raised in each quarter, according to a t-test on the four years of Crunchbase data I tested. Second, there is a meaningful difference in the size of rounds by quarter. 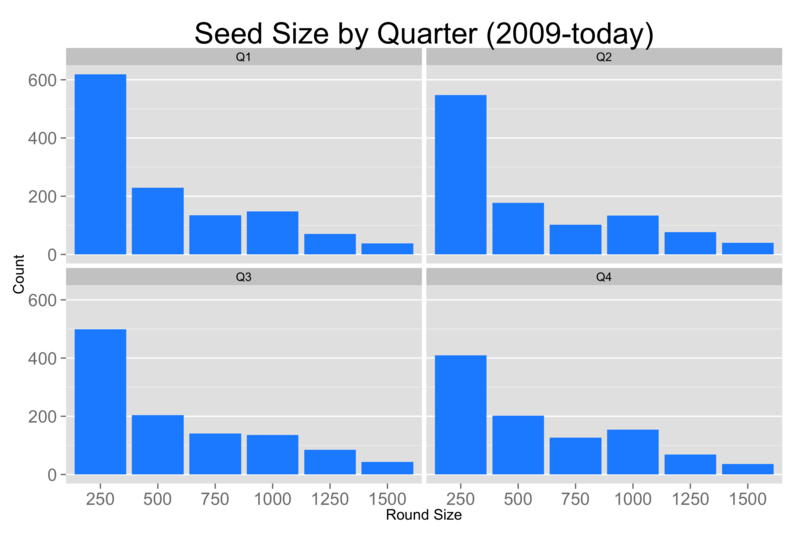 The chart below depicts the mean and median size of seed rounds by quarter. 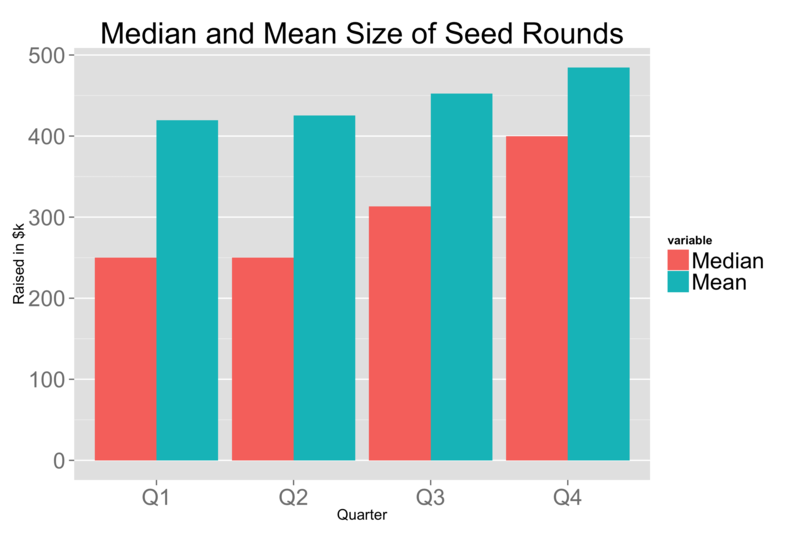 Interestingly, seed rounds in Q4 are on average up to 15% larger, and in median are up to 60% larger than Q1. The t-test shows a p-value of 0.00012, meaning the difference compared to Q1 is statistically signifcant. But the difference between quarters 2, 3 and 4 aren’t material. Digging one level deeper, I’ve charted the distribution of seed rounds by investment size below. This data spans the last 4 complete years. Q1 is the least attractive quarter in which to raise a seed round. Of those companies who do raise a round, the median and average round size is smaller in Q1. Possible reasons for this trend? I wonder if there isn’t an investor dynamic where investors are more cautious at the beginning of the year and less so at the end. Much like media buyers who look to spend their excess budget at the end of year, investors may be looking to hit their dollar investment targets. Secondly, there might be some material differences in the time of year that startups are founded which would impact their fund raising timing and change the competitive dynamic during the course of the year. Last, it may be a statistical aberration caused by some indeterminate factor in the data. It’s important to note the data doesn’t give us any indication of fundraising success rate. I don’t know how many companies tried to raise and didn’t succeed or the fraction of companies who raised but didn’t achieve their total round size target. That data would help us understand the degree to which competition influences round sizes over the year. On the whole, Q1 does seem to yield smaller seed investments than other quarters during the year.